The title is sadly lacking in imagination, but the dish is full of flavor. It’s also a great quick meal to make when you are hungry. 1 3/4 cups dry rice, 1.5 TBL curry powder, 1/4 tsp salt, 1.5 TBL pine nuts, 2 cups water. Cook in a rice cooker, or on the stove. Allow to sit at least 10 minutes before fluffing. 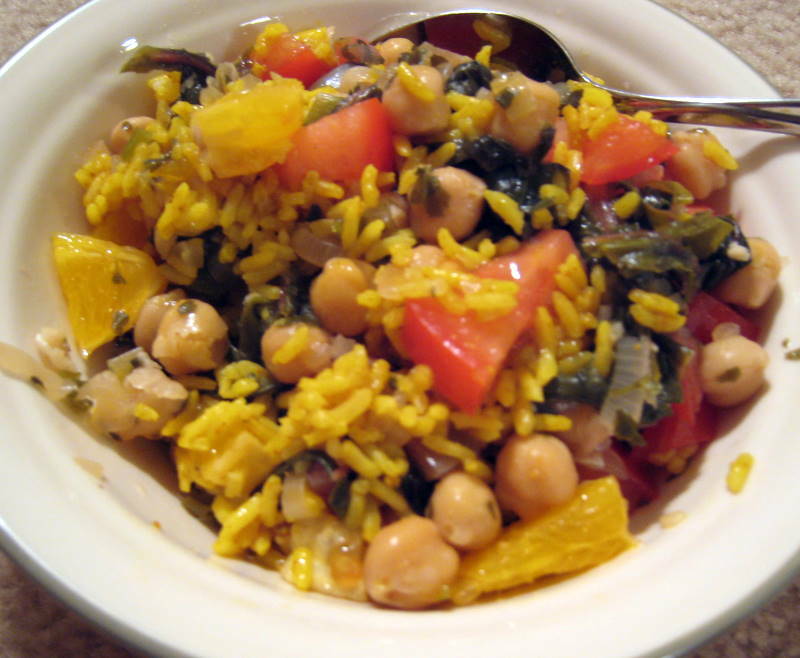 This entry was posted in chickpeas, curry, rice, swiss chard, vegan and tagged chickpeas, curry, oranges, rice, swiss chard, vegan by Beans, Figs and Katz. Bookmark the permalink. Oranges! Who would have thought? It looks good – I wish I was eating it right now. It’s really good, let us know how it turns out for you!